The post MJX B2W SE Review: Affordable GPS Drone with Special Edition Features appeared first on Dronethusiast. The post Drone Footage of Snow Storm Blanketing Vermont Town appeared first on Dronethusiast. The post DJI Facing Massive $150 M Fraud appeared first on Dronethusiast. The post Dronethusiast Roundup | The Best Drone Videos Of January 2019 appeared first on Dronethusiast. Comparing GoPros: Is the New Go Pro 7 Really Worth It? When choosing an action camera, GoPro is always the go-to choice. However, they’re updated so fast, it can be hard to keep up. At first, the new GoPro Hero 7 Black looks almost identical to its predecessor. And it is from the outside. But internally, there are about five important changes that improve the camera’s performance. As far as GoPro cameras go, this is a goodie. Please read on to find an extensive GoPro Hero 7 Black review. As the name suggests, this new feature has been hyped up in GoPro Hero 7 Black reviews. It’s probably the most dramatic improvement of this model compared to the GoPro Hero 6 Series. Hypersmooth stabilization refers to the improved electronic image stabilization feature. This stabilization now works in 4K/60fps mode, although it’s still digital and not optical stabilization. GoPro says it’ll allow for gimbal-like quality stabilization – so it must be good! And it is. Our tests unveiled that the results look amazing, especially when running or doing extreme sports. Nick Woodman, founder of GoPro, has gone as far as calling this Hypersmooth Stabilization, “the best in-camera video stabilization in any camera, ever”. Again, we agree. The in-camera stabilisation is amazing. I wish more cameras offered such a smooth and “invisible” in-camera stabilisation. But still, the GoPro Hero 7 Black and its HyperSmooth are less precise than a gimbal. Check out this great alternative, if you are looking for a tiny camera that delivers stable results. Although, the GoPro Hero 7 Black doesn’t come with a variety host of new shooting modes, it does come with important, cool tweaks. These tweaks make it an exciting improvement for both old and new users. Let’s do the TimeWarp agaaaiiin! Related to HyperSmooth is the new time-lapse mode, TimeWarp. In this version of timelapse, the GoPro adds smooth stabilization allowing you to create a smooth first-person video, even on a bike ride. So, it works like a standard timelapse, by taking stills at regular intervals and then playing them back. It’s just a lot smoother. In this mode, the GoPro action camera is able to record video and then speed it up to add drama. Think flowers blooming, starts soaring through the night sky. We’re talking about drama with a capital D.
This feature is great for documenting a scenic road trip or enhancing your YouTube content. It’s cool and fresh and will make you look like a pro editor! We love it! This is huge, you can now live stream straight to social media sites with the new GoPro Hero 7 Black. Initially, you’re able to live stream to sites like Facebook, Vimeo, Twitch and YouTube. But GoPro has promised other platforms are on the way. This new addition of live streaming is a plus for everyone. It allows you to quickly and easily wrangle your content onto a variety of sites. While previously, GoPro cameras allowed you wrangle videos onto social media before, it was laborious. The GoPro Hero 7 Black just needs you to fire up the GoPro app with the touch of a button. 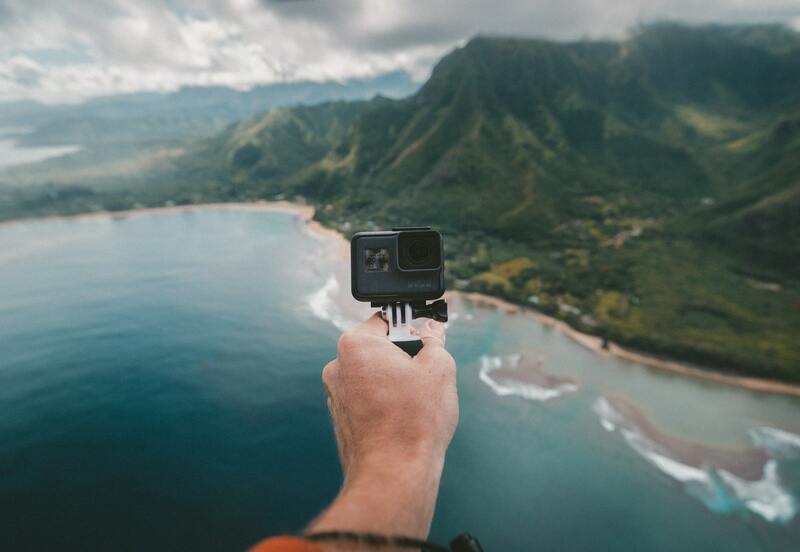 As we know, live video is trending and will continue to be a popular feature on social media.You’ll be a central part of this trend if you’re sharing your vacay footage straight from your GoPro. Talk about cool vlog content! The final two changes are a new ‘SuperPhoto’ feature for stills and a refreshed User Interface. The Huawei P20 Pro does it and now GoPro is doing it too. ‘SuperPhoto’ is GoPro’s way of replicating the intelligent auto modes seen on some smartphones. This is a high dynamic range (HDR) system and works as follows. The camera takes several exposures of the same photo and combines the best elements of each. Thus, one exceptional image is created. As far as smartphone pictures go, the GoPro HDR photos definitely give them a run for their money. These modes really are smart. They automatically recognize scenes and apply the appropriate camera settings. Along with this, the GoPro Hero 7 Black can even detect faces and smiles. As can be seen above, improvements to this GoPro offer something for everyone. The range of tweaks span different aspects of the camera and make the 7 the most versatile of the GoPro action cameras. Importantly, the GoPro Hero 7 Black remains at the price tag of the Hero 6 it replaces. GoPro Hero reviews remind us that the Hero 7 launched at the same price as the Hero 6. This basically means the best GoPro just got better without burning a hole in your pocket. If you’re asking, is a GoPro worth it? The answer is an unequivocal yes. The Hero 6 series is a very good camera and was a massive improvement from the 5. The Hero 7, therefore, adds functional features that improve an already good camera. Especially HyperSmooth! So, when asking ‘which GoPro?’ the general consensus is that the GoPro Hero 7 Black is a solid improvement from the Hero 6 series. People complained about the shakiness accompanying shots with the 6. In the Hero 7 Black, this issue has been totally ironed out (lol). This is because the GoPro 7 pre-empts your movements, keeping the image free of jitters or jerks. This is done by making use of the predictive smarts of the processor. Now, the GoPro Hero 7 Black has honed the skill of predicting your movements before it’s too late. This is undoubtedly a huge improvement and will save your footage from the yucky trash folder! When compared side to side with the Hero 6 series over a number of scenarios (skateboarding, cycling), there is a notable improvement. It’s pretty clear that the GoPro Hero 7 Black is in fact, worth it! These days, tech improvements are often measured in tiny bites and not milestones. With every smartphone upgrade, you get a slightly improved phone with small differences. A truly transformed device isn’t something you expect. However, this isn’t the case with the new GoPro Hero 7 Black. Instead of simply operating as an action camera, the GoPro Hero 7 Black is giving your trusty smartphone a run for its money. Sharing in real time, a new portrait mode and quick social media connection are just some features that have turned this camera into a whole new device. 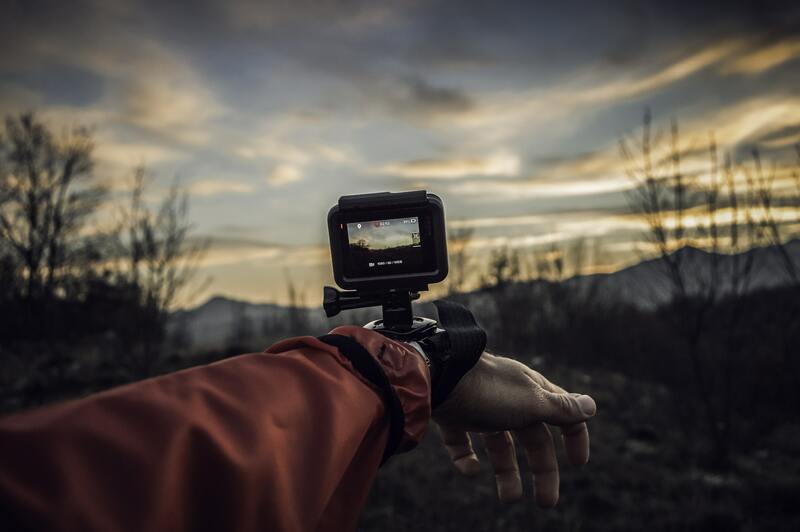 Go Pro Hero reviews agree that the 7 has opened GoPro up to a new wave of users. Especially those who work closely with social media. Which is basically everyone these days. You can purchase a GoPro Hero 7 Black on Amazon right here! The post DJI Announces New Smart Controller For Mavic 2 appeared first on Dronethusiast. The post Dronethusiast Roundup | Drone Predictions & Rumors January 2019 appeared first on Dronethusiast. The post Featured Expert: Sean Petit, Filmmaker & Founder Of Avian Cyclops appeared first on Dronethusiast.